Multi-store owner Daniel Marrazzo (center) poses for photographers after being surprised with a Community Service Award by Jeff Gardner (left), chairman of the LaundryCares Foundation, and Brian Wallace, president/CEO of the Coin Laundry Association. Ray Wang, principal analyst of Constellation Research, kept attendees on their toes as he described the Digital Transformation and the New Business Models Ahead. The view from a Naples Grande Resort guestroom. 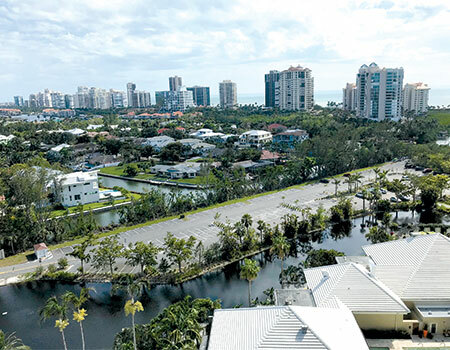 The resort underwent a multimillion-dollar renovation after Hurricane Irma struck the region in 2017. 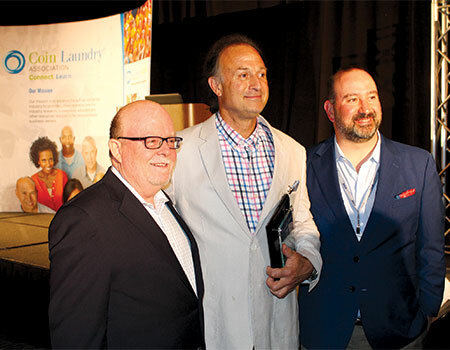 NAPLES, Fla. — The Coin Laundry Association’s (CLA) biennial Excellence in Laundry Conference continues to grow. 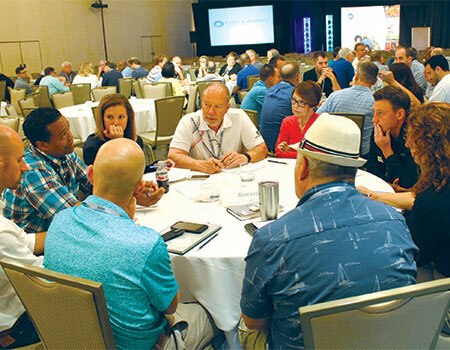 The two-day members-only gathering that concluded here Thursday at the Naples Grande Resort had a “head count” of 206, making it the largest since the event began in 2012, says CLA President/CEO Brian Wallace. Excellence in Laundry was created to provide top-quality industry education and unparalleled networking opportunities to self-service laundry operators during years when there is no Clean Show. In introducing the event during its opening session, Wallace called it an “unconvention,” explaining that the agenda was filled with speakers who hail from outside the laundry industry yet offer expertise valuable to any laundry business. First up was Ray Wang, principal analyst of Constellation Research, who talked in rapid-fire detail about the Digital Transformation and the New Business Models Ahead. The event didn’t completely move away from peer-to-peer interaction. During the next presentation titled Laundry Hacks, attendees split up into smaller groups and collaborated to build lists of tips and tricks they use to run their businesses more efficiently and for greater profit. Prior to the CLA’s dinner gala on the conference’s first night, leadership of the LaundryCares Foundation appealed to association members to donate in support of initiatives that include Free Laundry Days and a growing literacy effort. The CLA recently hosted the inaugural LaundryCares Literacy Summit in Chicago, in partnership with Too Small to Fail and Libraries Without Borders. 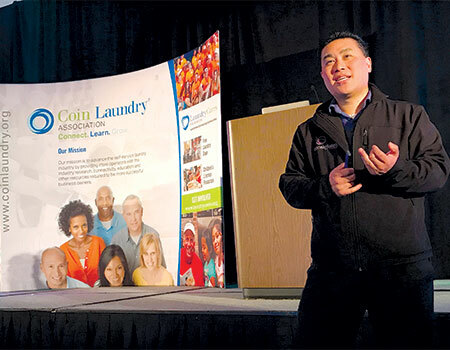 Allister Chang, executive director of Libraries Without Borders, was on hand at the Excellence conference and expressed to attendees the importance of Laundromats as community sites providing access to literacy and learning materials. Crystal Washington took to the podium to open the conference’s final day, speaking on the Future of Digital Marketing for Laundry Owners. Not even a fire alarm that caused the resort to be evacuated midway through her talk could derail the energetic speaker. After listing many of the popular social networks, Washington told attendees that she believes YouTube and Facebook offer self-service laundries the best forums based on their typical social media offerings. To close the education agenda, Joe Crosby, who runs the MultiState Associates government relations consultancy, described Today’s Legislative Landscape for Laundry Owners.